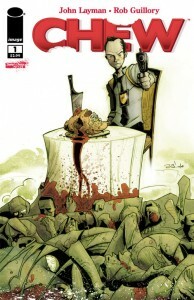 Showtime Adapting Comic Book “Chew” For New Series!!! Pay Cable network Showtime who has brought us “Dexter”, “Shameless”, and “Californication” has huge plans to develop the hit comic book from IMAGE COMICS called “CHEW”. Chew is an amazingly dark comedy story line. Chew is written by John Layman and illustrated by Rob Guillroy and follows police detective Tony Chu who has a haunting supernatural ability. His ability is known being a “cibopath” which means he has the ability to gain a psychic impression of an object by eating it. So him being a homicide detective, you can imagine the sick situations. Buy your CHEW COMICS HERE!!!! According to Deadline, the show will be a 30 minute series with the pilot being directed and the series executive produced by Stephen Hopkins. Hopkins directed Predator 2, Nightmare on Elm St. #5, The Ghost and the Darkness, and the film version of Lost In Space. But is most recently known for his tv work for directing the pilot episodes for “Californication” and “The Unusuals”. He has also directed episodes for “Shameless” and “24”. This series has the possibility to be BADASS. Let us hope. This entry was posted on Sunday, March 27th, 2011 at 12:06 pm	and is filed under Comics, Film, News. You can follow any responses to this entry through the RSS 2.0 feed. You can skip to the end and leave a response. Pinging is currently not allowed. « Check Out The New Red Band Trailer for “Your Highness”!! !